A child approaches Mimus's enclosure at the Design Museum in London. The way humans interact with robots has served society well during the past 50 years: People tell robots what to do, and robots do it to maximum effect. This has led to unprecedented innovation and productivity in agriculture, medicine, and manufacturing. However, an inflection point is on the horizon. Rapid advancements in machine learning and artificial intelligence are making robotic systems smarter and more adaptable than ever—but these advancements also inherently weaken direct human control and relevance to autonomous machines. As such, robotic manufacturing, despite its benefits, is arriving at a great human cost: The World Economic Forum estimates that over the next four years, rapid growth of robotics in global manufacturing will put the livelihoods of 5 million people at risk, as those in manual-labor roles increasingly lose out to machines. What should be clear by now is that robots are here to stay. So rather than continue down the path of engineering human obsolescence, now is the time to rethink how people and robots will coexist on this planet. The world doesn’t need better, faster, or smarter robots, but it does need more opportunities for people to pool their collective ingenuity, intelligence, and relentless optimism to invent ways for robots to amplify human capabilities. For some designers, working with robots is already an everyday activity. The architectural community has embraced robots of all shapes and sizes over the past decade: from industrial robots and collaborative robots to wall-climbing robots and flying robots. While this research community continually astounds with its imaginative robotic-fabrication techniques, its scope tends to be limited: This community is primarily concerned with how robots build and assemble novel structures, not how these machines might impact society as they join the built environment. In my own work, this underexplored territory has become somewhat of an obsession. I have striven to take my training as an architect (my hypersensitivity to how people move through space) and invent ways to embed this spatial understanding into machines. My latest spatially sentient robot—Mimus, created with support from Autodesk—has been living at the Design Museum in London since November 2016 as a part of the museum’s inaugural exhibition, Fear and Love: Reactions to a Complex World. Mimus is a 2,600-plus-pound industrial robot that I reprogrammed to have a curiosity for the world around her. Unlike traditional industrial robots, Mimus has no preplanned movements: She can freely roam around her enclosure, never taking the same path twice. Ordinarily, robots like Mimus are completely segregated from people, performing highly repetitive tasks on a production line. However, my ambition with Mimus is to illustrate how to design clever software for industry-standard hardware and completely reconfigure human relationships to these complex machines in the process. Mimus highlights the untapped potential for old industrial technology to work with people, not against them: It shows how small, strategic changes to an existing automation system can take a 1-ton beast of a machine from spot-welding car chassis in a factory to following a child around a museum like a puppy. 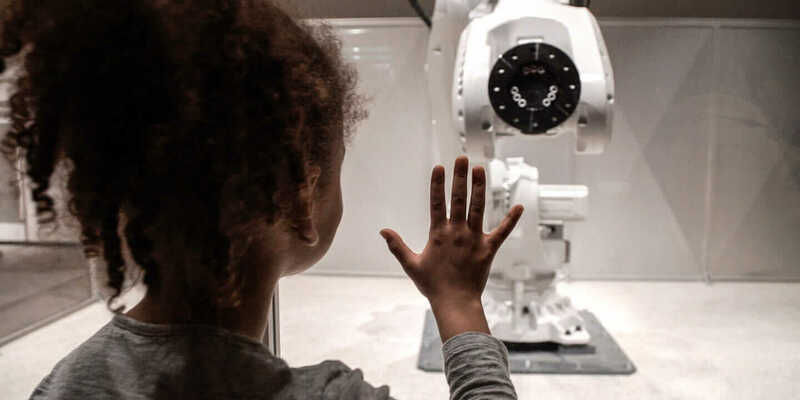 While this interactive installation may still stoke some anxieties, my hope is that visitors leave Mimus expecting a future when more human-centered interfaces foster empathy and companionship between people and machines. To be clear, I do not anticipate interactions with autonomous industrial robots to become a normal daily activity for most people. These machines are beginning to move out of factories and into more dynamic settings, but they will likely never stray too far from semicontrolled environments, like construction sites or film sets. However, experiments such as Mimus provide an opportunity to develop and test relevant interaction-design techniques for the autonomous robots that are already roaming skies, sidewalks, highways, and cities. These newer, smarter robots—like drones, trucks, or cars—share many attributes with industrial robots: They are large, fast, and potentially dangerous nonhumanoid machines that don’t communicate well with humans. For example, in a city like Pittsburgh, where crossing paths with a driverless car is now an everyday occurrence, a pedestrian still has no way to read the vehicle’s intentions (which can be potentially disastrous). Mimus communicates her internal state of mind through body language: When someone approaches from far away, she looks at the person from above with intimidating, suspicious posturing. But as a visitor nears her enclosure, she approaches from below with excited, inquisitive posturing. As intelligent, autonomous robots become increasingly prevalent in daily life, it is critical to design more effective ways to interact and communicate with them. In developing Mimus, I found a way to use the robot’s body language as a medium for cultivating empathy between museumgoers and a piece of industrial machinery. Body language is a primitive, yet fluid, means of communication that can broadcast an innate understanding of the behaviors, kinematics, and limitations of an unfamiliar machine. When something responds to people with lifelike movements––even when it is clearly an inanimate object––humans cannot help but project emotions onto it. However, this is only one designed alternative for how people might better cohabitate with autonomous robots. Society needs many more diverse and imaginative solutions for the various ways these intelligent machines will immerse themselves in homes, offices, and cities. Deciding how these robots mediate human lives should not be in the sole discretion of tech companies or cloistered robotics labs. Designers, architects, and urban planners all carry a wealth of knowledge about how living things coexist in buildings and cities—insight that is palpably absent from the robotics community. The future of robotics has yet to be written, and whether a person identifies as tech-savvy or a Luddite, everyone has something valuable to contribute toward deciding how these machines will enter the built environment. I am confident that design and robotics communities can create a future in which technology will expand and amplify humanity, not replace it. A version of this article originally appeared on Dezeen.